FIFA World Cup 2018 is the upcoming event that is going to be scheduled from 14 June to 15 July 2018. The top 32 teams will participate in this tournament. The team Russia automatically qualified because of host team while rest 31 teams will determined through qualifying competitions. The total of 64 matches will be played in 12 venues that are located in 11 cities and the final match will be took place on 15th July 2018 in Moscow at Luzhniki Stadium. 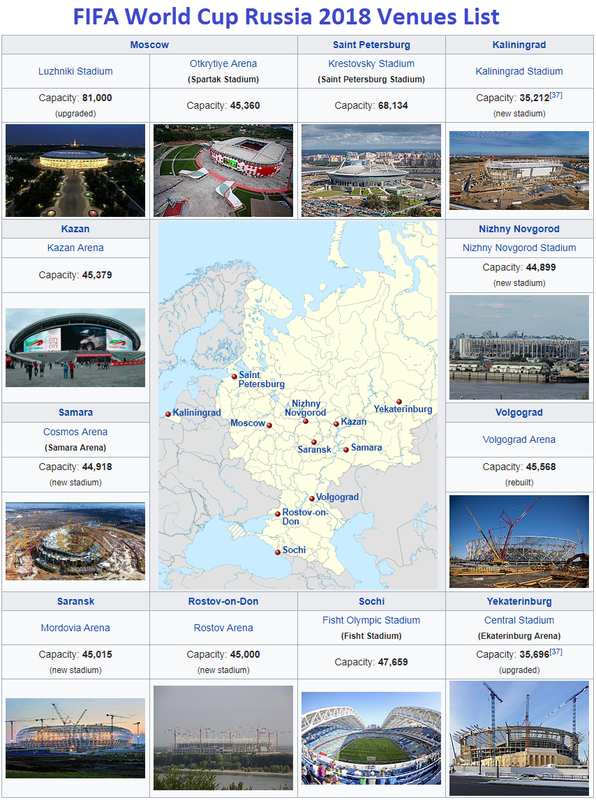 The list of host cities that was proposed by Russia, includes Kaliningrad, Kazan, Krasnodar, Moscow, Nizhny Novgorod, Rostov-on-Don, Saint Petersburg, Samara, Saransk, Sochi, Volgograd, Yaroslavl and Yekaterinburg. These all selected cities which are located in or just outside the Russia to reduce the travel time for the teams in this huge country. There are a total of 11 venues and 12 stadiums are dropped for the final list for this tournament that includes Luzhniki Stadium, Otkrytiye Arena (Spartak Stadium), Krestovsky Stadium (Saint Petersburg Stadium), Kalininhrad Stadium, Kazan Arena, Nizhny Novgorod Stadium, Cosmos Arena (Samara Arena), Volgograd Arena, Mordovia Arena, Rostov Arena, Fisht Olympic Stadium and Central Stadium (Ekaterinburg Arena).